A compilation of U.S. Life-Saving Service reports, newspaper articles, publications and more related to shipwrecks of the N.C. coast. Does not include ships that were hauled off or otherwise saved. 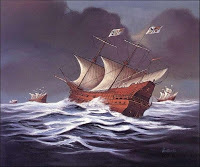 Many Spanish merchantmen sailed our coast, taking advantage of the Gulf Stream. It's recorded that at least three met their fate during the storm of August 18, 1750: The snow El Salvador sank near Cape Lookout, the Neustra de la Solidad went ashore on Core Banks and the Neustra Senora de Guadaloupe went ashore in Ocracoke. The most convincing proof of these wrecks is a Spanish coin that was found on the beach at Cape Lookout in 1992. Havana harbor was a hotbed of activity as the 1750 Spanish treasure fleet readied itself for the long and perilous voyage to Spain. It was August and the hurricane season was already upon them ... the vessels assembling beneath the mighty guns of Morro Castle numbered just seven. They had been placed under the overall command of Captain-General Don Juan Manuel de Bonilla, a brave and courageous man but one occasionally prone to indecision. The most important ship was the Admirante, or "admiral" of the fleet, Bonilla's five-hundred-ton, four-year-old, Dutch-built Nuestra Señora de Guadeloupe (alias Nympha). She was owned by Don Jose de Renturo de Respaldizar, commanded by Don Manuel Molviedo, and piloted by Don Felipe Garcia. Guadeloupe was a big ship, and had been allotted a substantial cargo of sugar, Capeche dyewoods, Purge of Jalapa (a laxative restorative plant found in Mexico), cotton, vanilla, cocoa, plant seedlings, copper, a great quantity of hides, valuable cochineal and indigo for dyes, and most importantly, as many as three hundred chests of silver containing 400,000 pieces-of-eight valued at 613,000 pesos. Among her passengers was the president of Santo Domingo, Hispaniola, as well as a company of prisoners. a sloop from Compeche, La Marianna, Don Antonio Ianasio de Anaya, commander. The small armada carries important passengers like the Governor of Havana and family, the quartermaster general of Chile and family, a treasure and luxury item shipment of the King's own company, and a silversmith as representative of another precious cargo's owner. They are similarly laden with more Spanish Reales (known as pieces-of-eight), valuable commodities, diamonds, and precious metals, all extracted from the conquest of Central and South America. But it is de Guadeloupe that is the greatest prize, with more than 12 tons of silver in 400,000 pieces-of-eight, each of which weighs one ounce. The early American silver dollar is based upon this coin and its weight / value in silver. That is why 25¢ is known as two bits. 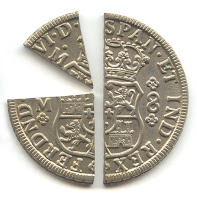 Two pieces (or bits) of eight make a quarter. The King is anxious for a successful voyage and transit of his goods. These valuables are sorely needed to replenish the Spanish treasurer from years of conflict with England and France, known in Europe as the "War of Austrian Succession", in the colonies as "King George's War." Mother Nature has other plans. This time, Bonilla's own flagship and its precious cargo will be jeopardized by the fierce weather. It will force him to trust a former enemy in a desperate encounter with English privateers turned pirates - including some FitzRandolphs and a young Joseph (Thorne) Jackson of Woodbridge, New Jersey, that are the original subjects of my research. tales. The English and Dutch perspectives are contained in colonial government correspondence and news articles. The Jersey pirates' tale is told by shipmate William Waller in his 1750 testimony to the New Jersey Provincial Justices. The New Englander sloop story was passed down in the family of one of the ship's owners. But there are also two jokers in the pack, Owen Lloyd and William Blackstock. It is Blackstock, alias William Davidson, who tells their story in his 1750 testimony before Dutch West Indies Justices. He'll also tell us how some of the treasure gets buried on the "real" Treasure Island - and what happens to it next. Be sure to follow the links to learn more about these stories. 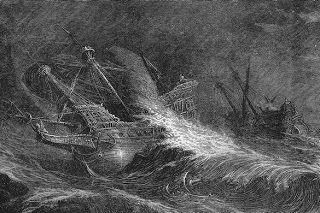 Three days after the first signs of bad weather, on the 28th, Los Godos makes contact with Guadeloupe as the separate ships continue to be battered by wind and waves not far from the Carolina coast. With nightfall, all contact is lost forever. The forces of nature continue to disperse the vessels' paths. Both vessels are driven relentlessly nearer the dangerous shoals of North Carolina's Outer Bank Islands at 33° North. The crews, passengers, and prisoners are left to pray that they do not share the watery fate of the livestock. On the 29th, the snow El Salvador is the first ship lost, breaking up in the waves on a beach near Topsail Inlet. Only a few crew escape, washed ashore with eleven boxes of the King's own silver. A Bermuda registered sloop captained by Englishmen Ephraim and Robert Gilvert survives a sandbar to anchor near the wreckage and scavenge it for sails and several chests of treasure. Soledad is lost south of Ocracoke near Drum Inlet, but all the crew and fourteen chests holding 32,000 silver pieces-of-eight survive. Guadeloupe stays afloat long enough for the winds to subside on the 30th. 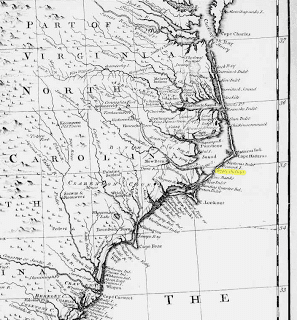 Bonilla anchors the broken-masted Admirante of the fleet several leagues south of Cape Hatteras. They weather out the storm tethered there overnight. 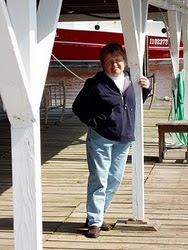 Bonilla assesses the degraded condition of his vessel the next morning and realizes she needs considerable repairs in the protection of the other side of the perilous Ocracoke Bar. High water and less wind might help the damaged hulk with makeshift sail maneuver to a safer harbor. At the same time, but hundreds of miles up the coast in New Jersey, a mariner named William Waller and one Margaret FitzRandolph, both of Woodbridge, take out a marriage license on the 1st of September. (NJ Archives, v22, p147) When the marriage occurs or if there is a honeymoon is not reported. But within three weeks, the groom will depart for the Carolina coast and an unexpected adventure with his new bride's cousins. We will hear more of Waller as the source for much of the New Jersey privateer's perspective in this story. By the 3rd of September the disabled treasure ship is maneuvered into the modest protection of the bayside of Ocracoke Inlet. (Stick & Stick, p38) Bonilla and some of his crew are ashore the first night when a "Bahamian snow named Carolina appeared on the scene and quietly made fast to the ship." (Shomette, p31) The pirates grab only a few things before being repulsed by the remaining crew, but Bonilla and de Guadeloupe remain awkwardly stranded on the colonial English shore for weeks. Two weeks later and back up the coast in New Jersey, Samuel Fitz Randolph sets sail from Perth Amboy on September 19 in his sloop, Mary, of Woodbridge. The crew includes Samuel's sons, Kinsey and Samuel Fitz Randolph, Thomas Edwards, Benjamin Moore, Joseph Jackson (born Joseph Thorne), Silas Walker, and William Waller - a newlywed for less than three weeks. The destination and purpose of the voyage is unreported in Waller's later testimony before the Provincial Court Justice Samuel Nevill. A week later in North Carolina, Governor Gabriel Johnston assembles his Council to get their support in dealing with Bonilla's predicament and the state of affairs it has created on the Outer Banks. The customs officers contend that the Spaniards unlawfully unloaded their cargo on North Carolina soil and should be seized for duties and penalties. The Governor suggests offering assistance and protection even though none has been requested. Colonel Innes, a member of the Council most experienced in the ways and language of the Spaniards, is sent to Ocracoke to investigate the situation and Bonilla's needs. Following the storm from the south is a seventy-five ton sloop, Three Sisters, captained by Zebulon Wade. The ship was built as a trader in Cohasset, Massachusetts, by Aaron Pratt, Stephen Stoddard, Israel Whitcomb, and Mrs. Binney. This was a step up in ships for Wade, son of a sea captain and great-grandson of Nicholas Wade, the immigrant that established the Wade family in Scituate 120 years earlier. (Burrage & Stubbs, p1420) Three Sisters is likely on the return leg of her maiden voyage, a "trading run to southern ports." The Vice-Governor of the Danish West Indies will later recall seeing the ship in harbor there. The Three Sisters destiny will take its crew to Ocracoake Inlet by September 3rd. Depending on the timing, they could have witnessed the arrival of the "Bahamian snow named Carolina" and the attack on de Guadelope that night. These accounts are silent on that point. Shomette describes the encounter from the Spaniards' perspective. In this version you will find that the Three Sisters is called the Seaflower. It is hard to say which name is correct. Seaflower is taken from a translation of contemporary records, while the name Three Sisters was passed on verbally for a hundred years before being recorded. At this critical juncture, two bilander sloops appeared on the scene. One was a New Englander called Seaflower, commanded by Zebulon Wade, of Scituate, Massachusetts, the other a New Jerseyman from Perth Amboy named Mary, Samuel FitzRandolph master and owner. Despite the piratical actions of the last English visitors on the scene, and his own fears that the newcomers might play another "scurvy trick," Bonilla guardedly viewed the arrival of the two sloops as an opportunity. The winds remained high and the water quite shoal in the shelter less cove, and his ship might be bilged at any worsening of the weather. With "the Intrigues and Artifices of Pedro Rodriguez Boatswain having got most of the Men on His side and under Pretence of going to Virginia," there seemed little choice. Calling his remaining loyalists together for a conference, the admiral proposed employing the two shallow-draft sloops "to keep his money and other effects on board, 'till he could either hire or buy another ship." It was so agreed. For some reason, perhaps to curry his favor, Rodriguez was sent aboard Mary to negotiate an arrangement to carry the cargo to Norfolk. One of FitzRandolph's crew, William Waller, of Woodbridge, New Jersey, served as interpreter. Within a short time, Mary's master had agreed to transport the lading to Virginia for a fee of 570 pieces-of-eight. A similar agreement was made with the master. of Seaflower. Soon afterward the Spaniard returned with fifteen hands in a launch to haul the two sloops alongside Guadeloupe. On or about October 5, as the transfer of treasure was under way, a certain Colonel Innes arrived bearing a letter from Governor Johnston, summoning Bonilla to New Bern to answer charges of illegally breaking bulk in the colony without permission. Bonilla, who had been expecting assistance, not a summons, was stunned. Fortunately, having also been sent to specifically inquire into Guadeloupe's situation, the Colonel was not unsympathetic to the Spaniard's plight. He had become immediately suspicious of the intentions of Mary and Seaflower and expressed his fears to Bonilla that the sloops would attempt to run away with the treasure. He even volunteered to take possession of them. In the meantime, a sloop-of-war might be provided for the purpose of carrying the money to safety. But to do so, it would be necessary for Bonilla to accompany him to meet with the governor. The Spaniard readily accepted. Rodriguez, however, now backed by many of the remaining crew and fearing that if the English got their hands on the treasure neither he or his men would ever be paid, vehemently protested and "would not suffer the Money to be removed." Nevertheless, Bonilla set off immediately with the colonel. While Bonilla was making arrangements for the protection of the King's treasure, on shore some privateers are scheming how nice it would be to take it for themselves. They are frequent travelers in the waters between the Carolinas and Carribean commonly known as the Bermuda Triangle. First they observe the stranded galleon, then the arrival of the sloops. But it is the effort to preserve the large ship's cargo that gets their attention fixed upon the galleon. Knight describes the scene for us. William Blackstock, who also went by the name of William Davidson, was born in Dumfries, Scotland. A mariner by trade, he had sailed out of Rhode Island at the end of September, 1750, and put in at the Ocracoke Inlet on or about the 1st of October. Coincidental to this plotting and the salvaging of the Guadeloupe's cargo on October 5, 1750, England and Spain sign the Treaty of Madrid, formally ending 11 years of hostility. Yet to be ratified, it will be eight months before the Treaty will be announced to the Colonies with a copy published in a Philadelphia newspaper. (Baynes, p743; Collections v.10, p.271) That treaty sets an expectation of mutual respect and cooperation between the English and Spanish. It specifically details these expectations in cases of piracy since a catalyst in 1738 for starting the war was English outrage over Spanish piracy. Captain Robert Jenkins reported to the British House of Commons how Spanish Coast Guards boarded and pillaged his ship and abused his person. Upon holding up his amputated ear as evidence, the conflict also became known as the War of Jenkins' Ear. (Britannica) It would seem this cause is not the motivation of Owen Lloyd and William Blackstock, however.